As part of its campaign announced late yesterday to support the upcoming World AIDS Day, Apple has also confirmed its annual Black Friday sale on November 28, which is branded this year as the (RED) Special Shopping Day Promo. The U.S. promotion is offering (RED) gift cards to customers who purchase a qualifying product on Black Friday. Unlike last year, Apple is including the iPhone in the (RED) promotion this year, offering a $50 gift card for iPhone 6, iPhone 6 Plus, iPhone 5s, and iPhone 5c purchases except for those made with no money down through the online store. The (RED) Special Shopping Day Promo begins on November 28 and lasts for one day or while supplies last. This Black Friday sale is part of Apple's recently announced World AIDS Day campaign, and in addition to the gift cards for customers on Friday, Apple will also donate a portion of its retail and online sales from Black Friday, November 28 and Monday, December 1 to the Global Fund to fight AIDS. these are only iTunes gift cards, not Apple store cards. gift cards can only be used for iTunes or their app stores. 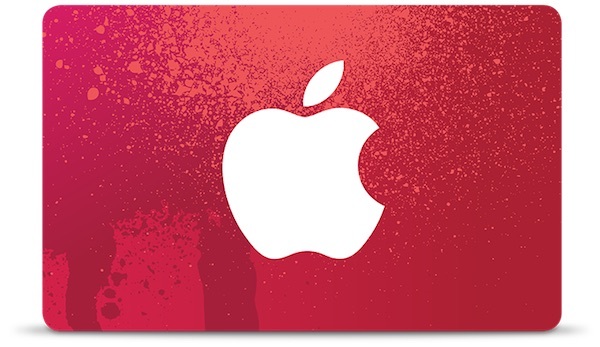 "Subject to Gift Card Quantity Limits, those who purchase a Qualifying Product on November 28, 2014, may receive a (RED)® iTunes Gift Card in the amount below that can be used at the U.S. iTunes Store, Mac App Store, App Store, and iBooks Store"
Surely there is a little margin they could spare. These seem in line with the traditional holiday offers. Tis the season to buy Apple with as close to a discount as you're going to get. And I'm sure if they were offering $150 you'd post here saying they should've offered $200....etc, etc, etc. If getting the best deal in the world is what it takes for you to buy then you didn't want the product in the first place. How is it lame? They're giving you something for free that they don't have to give you at all. It's Apple. they don't NEED to discount anything to sell it. So are you saying that they don't NEED the sales numbers from Walmart, Best Buy, Target, and ToysRUS that are discounting these products heavily? This isn't 2010. Apple used to be strict with 3rd party pricing. Now they aren't. They want sales.... So don't get mad at people for asking Apple 1 day out of the year to discount their own site. You might want to specify that last year's was an Apple Store gift card and this year is an iTunes Gift Card, which might be worth significantly less to some people. Actually to me the ITunes card is worth more. I have $125 in Apple cards that I am trying to convince myself to use without getting ripped off. Can you not by iTunes cards with Apple cards? I am surprised that they differ, I thought if you used self-service in store purchasing that it would use your iTunes balance and then your credit card on file?